I’m sitting on the couch, browsing through the slate of NBA games on the day, and right there it dawned on me: this season has been so fun. A lot has gone on this year and has made me more intrigued than I have ever been for an NBA season. There are a lot of contributing factors, with one of those undoubtedly being that the Oklahoma City Thunder, my favorite team, are very competitive this year and look to be legit contenders. However, that’s the thing. It’s not just the Thunder that are competitive. It’s not even just a handful of teams. It legit seems like over half of the league have a decent chance this year to make some noise come playoff time. In years past, it always felt like we knew it would be the Warriors and the Cavaliers in the NBA Finals, and we were right for four years straight. But now, everything seems a little more wide open. The Warriors look beatable. Teams are starting to leave Draymond Green wide open beyond the arc and doubling another threat elsewhere. And it’s worked. I’m sure Steve Kerr will find a way to adjust, and getting DeMarcus Cousins back later in the season will only help their cause. But until then, there’s hope. LeBron James no longer reigns supreme in the East. Ever since he moved to the Western Conference with the Lakers, people argued which team would step up. The Toronto Raptors look to be that team. Trading for Kawhi Leonard looks more and more like such a great move this offseason for them, and they may be able to convince him to stay long-term. However, there are a few teams close behind. The 76ers, Bucks, Pacers, and Celtics are all candidates to represent the East in the Finals. Heading back to the West, I wrote earlier in the month about how wide open the conference is. Fourteen teams all have their eyes on making the playoffs. Are all of them contenders to win the Finals? Or even make the Finals? Probably not. But the thing is, this makes the NBA greater as a whole. Their are less teams tanking which makes more games competitive. I’m looking at the standings and I see about five teams who have probably decided at this point that they don’t have a good chance to make the playoffs, and even if they did manage to, they wouldn’t be competitive. The rest of the NBA seems fixated on fighting for the playoffs, at least for now, and therefore make the NBA better to watch. The narrative seems to be the same for the MVP race as well. There are a few front runners, with Giannis Antetokounmpo, Kawhi, and LeBron leading the pack. But there are also a large handful of other players that will be in the mix. A few familiar faces are up the such as James Harden, Anthony Davis, Stephen Curry, Russell Westbrook, and Kevin Durant. But there are also a few other names that deserve recognition. Joel Embiid has been a monster, and has shown everyone what he can do when he can play a full, healthy season. Paul George may be second fiddle in OKC to Westbrook, but he has been on a scoring tear in the month of December as well as playing great on the defensive end. Nikola Jokic has his Nuggets atop of the Western Conference standings, and his ability to play as a point forward has granted him as an MVP candidate. I’ll even mention one of my favorite story lines of the year, and that’s the rookie sensation Luka Doncic. The kid already looks to be a lock for the Rookie of the Year award with more than half of the season yet to play. It’s not just the numbers he’s putting up, but the way he’s doing it. His level of confidence is something you just don’t see in 19-year old kids in the NBA. He’s a bonafide killer, hitting step backs in the faces of whoever dares challenging him. Yes, I get it. Most people don’t realize that he’s actually been playing at a high level of competition for a few years now over in Europe. If anything, his overseas experience leaves him more ready than most that come into the NBA. However, the point still remains, he’s still just a teenager. He’s nowhere near his peak, and the level of play he’s at now is just so impressive, and his future is almost scary to think about. This year has nothing short of exciting to watch. I feel more engaged than I can remember for an NBA season. I don’t know what the season’s end holds for us like recent years, so this makes this year more exciting and special. As the year progresses, I’m sure we will see a few more teams drop in the standings and start narrowing down the true contenders. And yes, we could still see the Warriors win again for the fourth time in five years, but that’s not important. What is important is the journey that leads to the Finals, and the season thus far has been quite the enjoyable spectacle to witness. 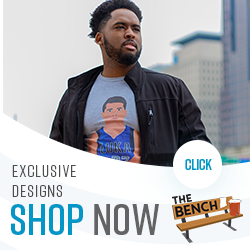 Check out our shop for exclusive NBA, NFL, and pop culture designs! Previous Post: Miles Above the Rest: An Into The Spider-Verse Review!